When I have grandchildren, I want to be the grandparent who is in amazing shape and in better shape than the parents. This will be challenging; I have some athletic kids. Snatches and squats in particular, but most anything is fine… except for my dislikes. What is the key to your success from training here at FIT? Consistent effort, and listening to my trainer. Also, I think cleaning up my diet has helped a lot. I can now do halfway-reasonable overhead squats. If you saw what any of my squats looked like when I first started, you would have bet serious money I would have never gotten where I am now. Keys to success (in Danielle’s words): Sean’s key to success is coming into FIT once a week, training on his own three to four times per week, and paying close attention to his sleep, stress, nutrition, and recovery. When Sean started at FIT in the summer of 2007, he had a couple of goals in mind: 1) He wanted to learn how to properly deadlift and squat; and 2) Gain better overall fitness (increasing strength, muscular and cardiovascular endurance, and flexibility). 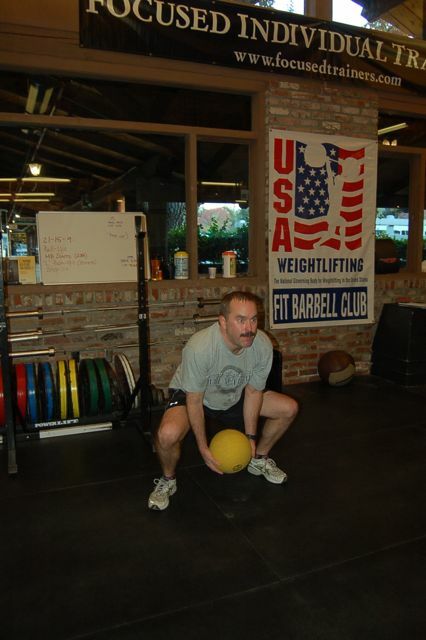 Starting out, Sean had limited range of motion performing all types of movements, especially squats and deadlifts. Two years later, Sean’s dedication has acquired him to have full range of motion in all of his movements; he has increased his strength and endurance; and he can execute more complex movements with no pain. Sean we are proud that you are part of FIT and succeeding on living a healthier lifestyle. Congratulations!